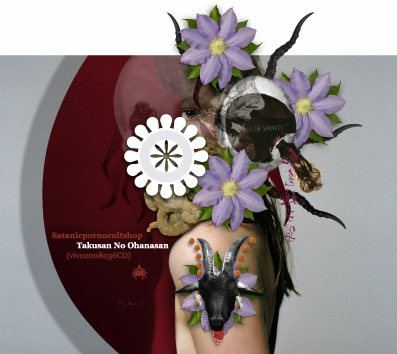 :: ALBUM OF THE YEAR :: SATANICPORNOCULTSHOP - Takusan No Ohanasan (Vivo Records): Get well, eat well, rest up, sleep well and press play. A multiplied experience with stunning samplemania strategy packed in a gloomy image with a touch of 'ouch' to it that starts to pump the vein. The second release by the Japanese quartet for Vivo Records, following '.aiff Skull', is placing the break-samplemania course to evident social comfort. Besides the brave manipulation and lucid production, storing tracks with rapid-fire drum'n'bass, there are pop stops in the album with sentimental encounters along with opposite illustrious jittery mish-mash of various music cultures. This sort ought to have legible meaning with o guidance and no option but to run through the possibilities. Most lavish subculture release. High five!